Delicious. That is this recipe summed up into one word. Many thanks to NancyCreative for this recipe. It is comforting and so tasty. Enjoy! #1: I made this for our Christmas breakfast in 2013 and made the following alterations. I used the 28 oz. bag of Yukon Select Hashed Browns (Alexa brand) which have garlic, onion, white pepper and sea salt. I used a can of cream of celery soup instead of chicken. I added just a bit of shredded cheese to the top before adding the cornflake topping. #2 (Our Favorite): I made this variation in March of 2014. I used a 28 oz. bag of Crispy Seasoned Potato Puffs (Alexa brand) which have seasonings of roasted garlic, black pepper, sour cream and chives. I used a can of cream of celery soup. This has a much better flavor I have found than the chicken. I added some dried minced onion instead of chopped fresh onion. I added one diced cured ham steak and mixed that in with all the hashbrown casserole ingredients. To the top, I added a thin layer of a shredded cheddar, then the cornflake topping as directed. Far and away this has been our favorite way to make this casserole. Preheat oven to 350-f degrees. Lightly spray a 9"x13" baking dish with cooking spray. In a large bowl, combine thawed hash browns with 1/2 cup melted butter and all the remaining ingredients except the corn flakes. Spread into baking dish. Mix 1/4 cup melted butter and the crushed corn flakes together and sprinkle over top of casserole. Bake at 350 degrees, uncovered, for 1 hour. Serve hot. Hi Ali, your hashbrown casserole look scrumptious. Great for breakfast. Thanks for sharing this delicious recipe. I'm following you. Have a lovely week ahead. You had me at hashbrowns! It looks SO good! I think this will be a good side with the brisket for Christmas Eve dinner. Thanks for sharing. 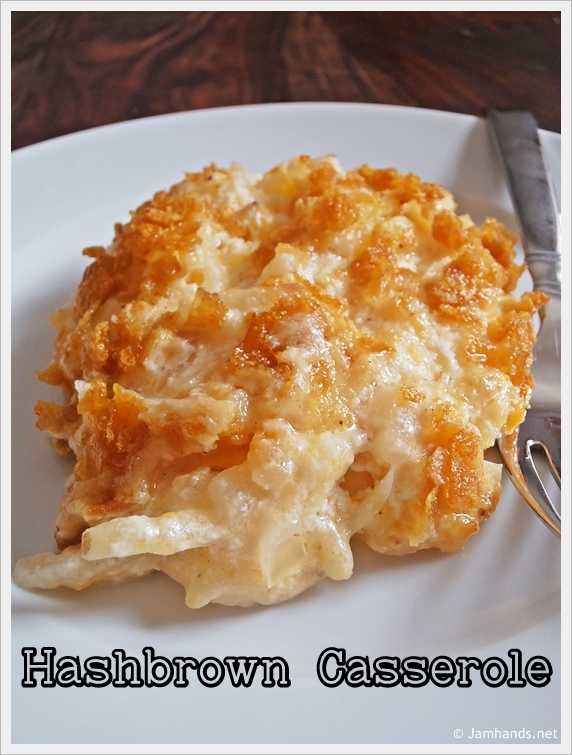 Love Hashbrown Casserole! Although I don't use the cornflakes. It looks great though so I may try them real soon. Hi! This looks absolutely delicious! Do you know what I could use instead of the soup? Thanks! Could this recipe be halved, only 2 at my table! If you are looking to freeze this... do you cook it first and thaw or mix up ingredients, freeze, and then thaw to cook? My favorite go-to breakfast side! Perfect for brunch. It is now a tradition at Christmas morning too :) Thank you for posting!